Vietnam: Persecuted rights advocates in Vietnam seek help from world's democracies. The following article was written for Morning Star News (MSN), a 501(c)(3) non-profit corporation that specializes in supplying original news reports of persecuted Christians, so as "to empower those in the free world to help and to encourage persecuted Christians that they are not forgotten or alone." (Morning Star News) – In 2006, the U.S. State Department removed Vietnam from its list of Countries of Particular Concern, citing the release of religious prisoners and the easing of religious restrictions. Two months later, the United States granted Vietnam permanent normal trade status, paving the way for Vietnam to join the World Trade Organization in January 2007. 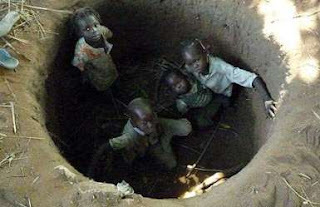 As soon as the regime had secured its goals, however, it unleashed a crack-down. Among the first to be arrested was internationally acclaimed human rights lawyer and religious liberty advocate Nguyen Van Dai, a Protestant Christian. 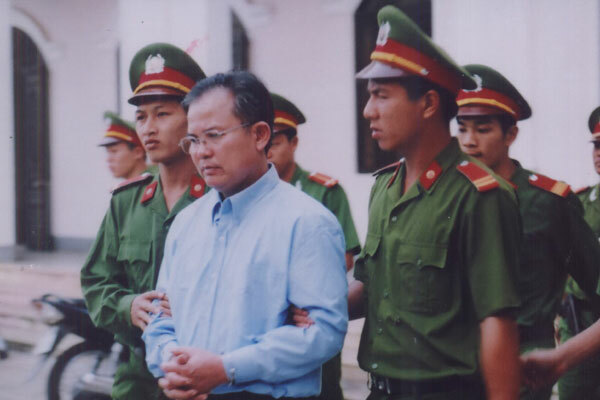 Arrested on March 6, 2007, and deemed guilty of violating Article 88 of the criminal code – “conducting propaganda against the state” – Nguyen Van Dai spent the next four years in prison in Hanoi (to March 2011) followed by four years house arrest (to March 2015). Dai, 47, was subsequently re-arrested on Dec. 16, 2015, as he was preparing to meet with European Union representatives who were in Hanoi for the annual EU-Vietnam human rights dialogue. He is being held incommunicado, charged with violating Article 88, the maximum sentence for which is 20 years. Denied access to her husband and fearing abusive treatment and unjust processes, Dai’s wife, Vu Minh Khanh – also a strong Christian and courageous religious liberty advocate – is seeking assistance from the world’s leading democracies. 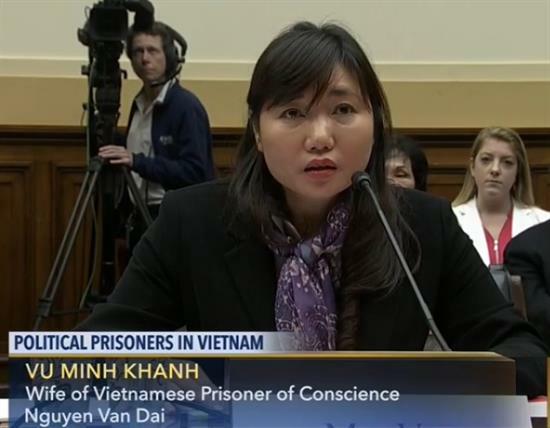 On May 10, Khanh presented her testimony to the U.S. House of Representatives’ Committee on Foreign Affairs, Subcommittee on Africa, Global Health, Global Human Rights, and International Organizations, chaired by Rep. Chris Smith. She is now in Australia, traveling with Vietnam Voice. On May 23, while on an official visit to Vietnam, U.S. President Barack Obama lifted the decades-long embargo on selling lethal weapons to Vietnam without requiring any concessions in return. Smith called Obama’s move an “epic failure of diplomacy.” Phil Robertson, deputy director at the New York-based Human Rights Watch agreed. “In one fell swoop, President Obama has jettisoned what remained of U.S. leverage to improve human rights in Vietnam – and has basically gotten nothing for it,” Robertson said. In giving the ruling Communist Party of Vietnam exactly what it wanted without requiring anything in return, Obama has essentially given the party a green light to further escalate repression and persecution. Consequently, religious liberty advocates hold grave fears for Dai and Khanh, especially as those fears are personified in the plight of pastor Nguyen Cong Chinh and his wife, Tran Thi Hong. The Rev. Nguyen Cong Chinh, a 45-year-old Protestant in the Central Highlands province of Gai Lai, has suffered systematic, violent persecution at the hands of Communist Party officials since 2003, when he protested ethnic-religious persecution and appealed for religious liberty. Arrested on April 28, 2011, Pastor Chinh was sentenced on July 31, 2012 to 11 years in prison for violating Article 87 of the criminal code, “undermining national unity.” In prison, he has been subjected to lengthy periods of solitary confinement, numerous beatings, deprivations (including being denied the right to pray), and humiliating and traumatizing Cultural-Revolution- style criticism sessions that fuel inmate hostility against him. Also targeted for systematic violent persecution is Pastor Chinh’s wife, Tran Thi Hong, for she too is a courageous religious liberty advocate. On March 30 March, local regime officials forcefully prevented Hong from attending her scheduled meeting with a U.S. delegation led by David Saperstein, Ambassador-at-Large on International Religious Freedom. The meeting only went ahead after Hong managed to inform Saperstein that she had been ambushed, seized and escorted back home, at which point Saperstein intervened. Mrs Tran Thi Hong, 14 April 2016. 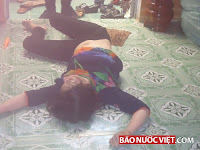 On the morning of April 14, however, officials abducted Hong from her home and took her to the office of the People’s Committee of Hoa Lu Ward, where she was interrogated and beaten by plainclothes agents for three hours, leaving her with injuries to her head, knees, legs, hands, and feet. In May, Hong was forcibly dragged to the police station and interrogated on May 11, 12, 13, 27 and 28. On May 13, when her distressed 18-year- old son tried to protect her, he too was assaulted, strangled, bound and detained for the rest of the day. China’s territorial expansion in and militarization of the South China Sea has Vietnam looking for friends and allies. This new dynamic gives Western democracies more leverage with Vietnam than they have had in years. What post-Christian “progressive” Western elites need to understand is that in Vietnam, the church is integral to civil society and is at the center of virtually all humanitarian, pro-democracy, and human rights work. Consequently, a strong defense of religious freedom is a highly strategic means of advancing humanitarian work, human rights advocacy, and capacity building to further democracy and liberty. This post provides extra detail on the EU-Sudan deal mentioned in Religious Liberty Prayer Bulletin (RLPB) 360, “SUDAN: War and Famine, Impunity and EU Funding”, by Elizabeth Kendal, 8 June 2016. Desperate EU Emboldens Murderous Sudan. By Religious Liberty Analyst, Elizabeth Kendal, 8 June 2016. Humanitarian organisations, Christian ministries and compassionate individuals that have long supported the persecuted church and other victims of Khartoum’s murderous Islamist regime – through the second civil war (1983-2005), the first Nuba Genocide (1990-1993), and now into the third civil war and second Nuba Genocide (from May-June 2011 to the present day) – will be horrified to learn that the murderous Government of Sudan (GoS) will soon be in receipt of funds from the desperate European Union (EU). On 23 March 2016, the ambassadors of the EU’s 28 member states attended a secret meeting in which they agreed to work together with Sudanese President Omar al-Bashir to stop the flow of refugees to Europe. According to Germany’s Der Spiegel, “the leading diplomats that day discussed a plan that the EU member states had agreed to: They would work together with dictatorships around the Horn of Africa in order to stop the refugee flows to Europe -- under Germany’s leadership. 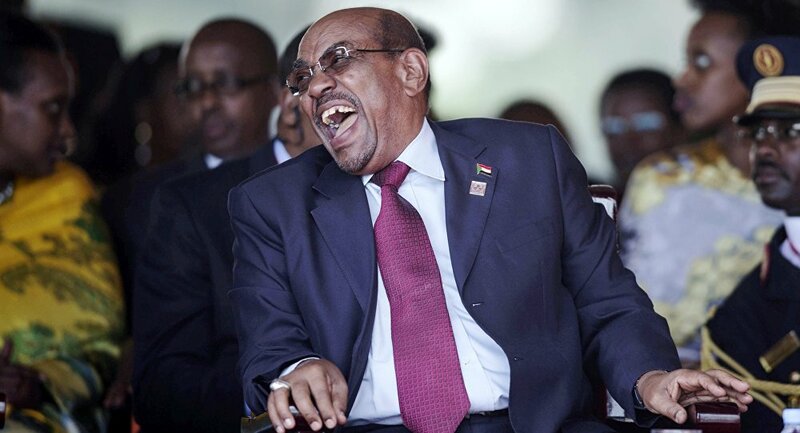 Sudan's President Omar al-Bashir, laughing, 12 May 2016. The EU will send “cameras, scanners and servers for registering refugees” to Sudan, despite the fact that the GoS is profoundly repressive and a known sponsor of international terrorism; and despite the fact that Sudan’s National Intelligence and Security Service (NISS) is a confirmed human rights abuser known to torture prisoners. The EU will also help train Sudanese border police and assist with “the construction of two camps with detention rooms for migrants”, despite knowing that GoS officials and military personnel are known to be deeply involved in the human trafficking business, including the selling of Eritrean refugees – many of whom are Christians fleeing religious persecution – to those who transport them to the Sinai where they are tortured for ransom. In other words, desperate Germany will help criminal Khartoum build what are essentially two concentration camps for refugees and migrants, despite the fact that Khartoum’s government-administered “peace camps” (as the camps for displaced are called) have traditionally made receipt of food conditional upon conversion to Islam. “During a visit to Sudan today [5 April], EU Commissioner for International Cooperation and Development, Neven Mimica will discuss increased EU cooperation with Sudan on issues of common interest. He will also announce a €100 million Special Measure for the country, to be implemented under the EU Emergency Trust Fund for Africa. . . So Khartoum will receive a $112 million aid package to “address the root causes of irregular migration and forced displacement” in Darfur, South Kordofan and Blue Nile, despite the fact that Khartoum IS the root cause of irregular migration and forced displacement from Darfur, South Kordofan and Blue Nile. The EU will expect Khartoum to curb migration from these conflict areas by means of reducing poverty, promoting peace, creating jobs and delivering services, despite the fact that Khartoum is actively engaged in and committed to ethnic cleansing. committed 'war crimes' in South Kordofan"
This desperate EU deal will embolden the murderous Islamist regime in Khartoum, which will see the deal as a green light to escalate war, jihad, aerial bombardments and the engineering of famine, along with human trafficking, forced conversions and all manner of racial and religious hatred-inspired abuse and persecution. By Jürgen Dahlkamp and Maximilian Popp, Der Spiegel, 13 May 2016. 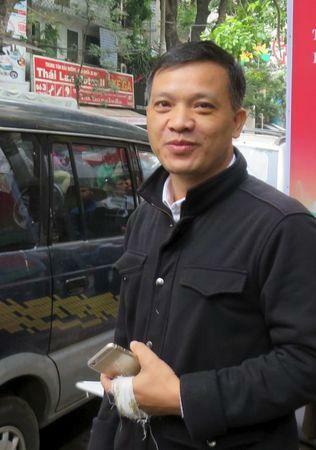 On 16 December 2015, Vietnam's internationally acclaimed human rights lawyer and religious liberty advocate Nguyen Van Dai (47) was re-arrested, just days after being violently assaulted. On 10 May 2016, his wife, Mrs Vu Minh Khanh, presented her testimony to the U.S. House of Representatives’ Committee on Foreign Affairs, Subcommittee on Africa, Global Health, Global Human Rights, and International Organizations, chaired by religious liberty champion, Rep. Chris Smith. After explaining that her husband has already suffered four years imprisonment (March 2007-2011) followed by four years house arrest (to March 2015) on account of his human rights advocacy, Mrs Vu Minh Khanh proceeded to plead her husband's case. “. . . In 2000, my husband officially began his activism and fought for freedom of religion and was a human rights lawyer. . . 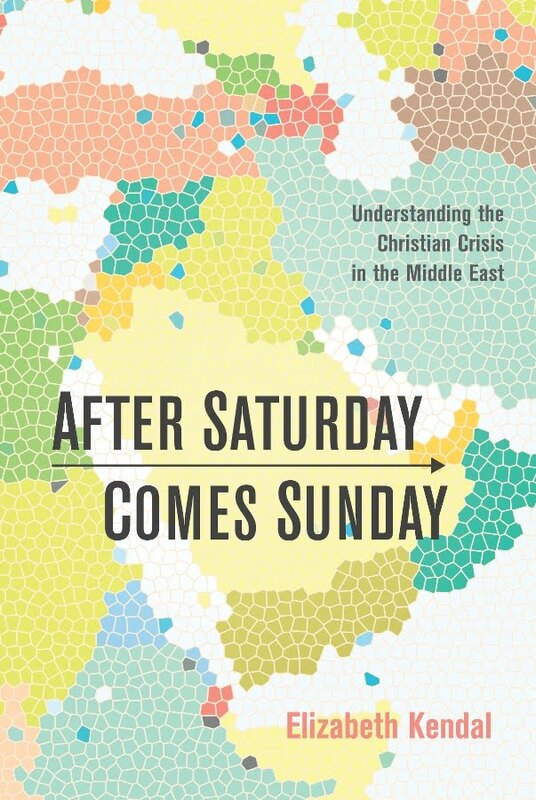 Thereafter, my husband provided free legal services to Christians who were oppressed based on their religion, those who fought for democracy and human rights who are harassed and detained, victims of land grabs or home lost, and to people who were physically attacked and arbitrarily detained. He lead training courses about human rights at his law office. “. . . he always fervently tried to fight for freedom of religion, freedom of speech, and freedom of assembly through non-violent methods and through providing education on human rights. . . Throughout his human rights activism, my husband was constantly followed, threatened, harassed and beaten. My husband is currently charged under Article 88 of the Penal Code [“conducting propaganda against the state”] and faces 3 to 20 years imprisonment. “. . . My husband has worked hard to protect human rights and these activities cannot possibly be seen as criminal. Therefore, I hope that Congress and the U.S. government will help demand for his immediate and unconditional release. Subsequently, on 23 May, whilst on an official visit to Vietnam, President Obama lifted the decades-long embargo on selling lethal weapons to Vietnam, without requiring any concessions in return, leaving Rep. Chris Smith to lament the “epic failure of diplomacy”. Unsurprisingly, Rep. Chris Smith believes Obama struck a “bad deal”. While Stratfor Global Intelligence confirms that, “Hanoi is reportedly interested in U.S. helicopters, communications equipment, and possibly even used F-16 fighter jets,” the reality is, Vietnam has long purchased the bulk of its weapons from Russia, and this is unlikely to change anytime soon. Maybe this, and not Chinese expansion in the South China Sea, was foremost in Obama’s mind. In 2006, the State Department removed Vietnam from its list of Countries of Particular Concern, citing the release of religious prisoners and the easing of religious restrictions. Two months later, the US granted Vietnam permanent normal trade status, which paved the way for Vietnam to join the World Trade Organization (WTO) in January 2007. In giving the ruling Communist Party of Vietnam exactly what it wanted without requiring anything in return, President Obama essentially "folded", giving the regime a green light to escalate repression and persecution. This will certainly crush the hopes of Vietnam’s more than 100 political and religious prisoners, along with their loved ones and supporters. More critically, it will embolden a brutal totalitarian regime intent on silencing a multitude of Vietnamese dissident bloggers, pro-democracy activists, human rights lawyers and religious liberty advocates . . . including, of course, Mrs Vu Minh Khanh, who soon will return to Vietnam. 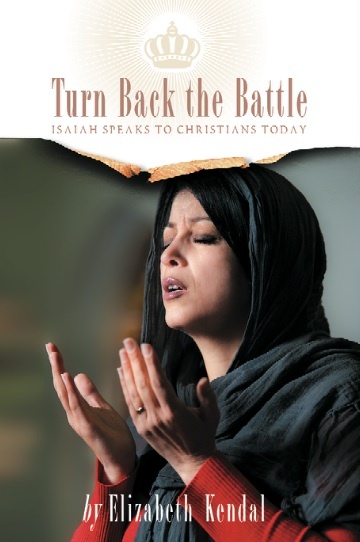 By Religious Liberty Analyst, Elizabeth Kendal.